Very few taglines seem more awkward or more accurate than the one used to promote Halloween II: “More of the night he came home.” If John Carpenter’s original Halloween kicked off the slasher-movie fad of the ‘80s (and, as any fan of Black Christmas or the bloodiest of gialli will tell you, it didn’t), then Halloween II arguably established its legacy of comfortingly predictable redundancy. More of what scared you the first time around, but diluted by the added layer of familiarity. More blood. More things jumping out from the negative space in the frame. More tittays. Halloween II begins by replaying the final minute of the 1978 charter film, establishing continuity. 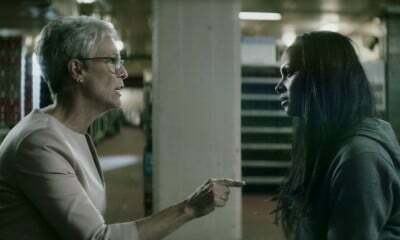 But the rest of the film’s events, which see Laurie Strode (Jamie Lee Curtis) being taken to the hospital while Dr. Loomis (Donald Pleasence) tracks Michael Myers around town by following the growing trail of bodies, seem to take their cues from the concurrent Friday the 13th series. Whereas the first film was coldly patient and unsettlingly lateral, with events that unfurled with the elegant, varying pace of a particularly self-immolating nightmare, the sequel is a carnival shooting gallery. Mayhem erupts not as an interruption in suburban idyll, but instead with the tick-tock flair of public transit. In the end, Carpenter didn’t direct the second installment in what was never supposed to be a series about Michael Myers. (The third film notoriously left “The Shape” out of the equation entirely, instead focusing on a New Twilight Zone-ish plot about a line of mass-marketed masks that, when activated, will kill every kid wearing them; it tanked and the fourth film swiftly brought Myers back to life.) Directorial duties were handed over to Rick Rosenthal, who does his best to mimic Carpenter’s smooth anamorphic prowling with the help of the original’s cinematographer, Dean Cundey. However, Carpenter and Debra Hill collaborated to write, as it were, the script, and there are plenty of times where it almost feels like they’re performing a deliberate act of sabotage, in contrast to the deconstruction that Rob Zombie’s two massively underrated reboots accomplished. Why would they force the immensely likable Curtis to spend most of the film in a drugged-out stupor, lying in bed like she’s waiting to be murdered? Why turn the clinical Loomis into a raving baffoon who, as it turns out, causes at least one innocent bystander’s death? Most crucially, why give Myers’s rampage a concrete, familial rationale? Was it not clear that the reason the original, an otherwise simple exercise in Hitchcock’s shock/suspense mechanisms, worked in the first place was that there’s no explaining evil? Virtually one element in the entire sequel understands that notion: that poor kid who bit down on the razor blade in his candy. Shout! Factory has cutely rebranded themselves Scream Factory for their new line of super-stacked horror releases. Halloween II is available on both Blu-ray and DVD (the latter of which was sent for review). Though Universal just last year released the film for its 30th anniversary, this new transfer gives it a new level of polish that’s evident even in the DVD version. The blacks seem to be deeper, and there appears to have been some further digital cleaning up. In fact, there are plenty of moments where, if you were to just simply judge from the images alone, you could be mistaken for thinking John Carpenter was still at the helm. The audio is similarly alive, mostly due to the gaucheness of Alan Howarth’s adaptation of Carpenter’s themes, but also thanks to the copious night sounds and directional leap scares. There are quite a few bonus features for a movie that deserves very few, but unfortunately Shout! Factory dropped (and likely couldn’t afford to license) the single best side dish from last year’s pressing: the 1984 clipfest Terror in the Aisles, which, if memory serves, included nearly as many scenes from Halloween II as almost any other horror movie. While that subtraction is a bummer for anyone who doesn’t hold Rosenthal’s sequel in particularly high regard, fans will have plenty to chew on with the inclusion of an alternate TV cut, a 45-minute “making of,” and two feature-length commentaries that are both, tellingly, missing the participation of Carpenter, Debra Hill, Jamie Lee Curtis, and Donald Pleasence. Rounding out the set are some mundane deleted scenes, and an effective, if cheap, alternate ending that would’ve probably better suggested the notion that Myers would return. In other words, plenty to watch with not a whole lot to see. Halloween II is no masterpiece, and established a framework for some of the hackiest filmmaking in horror history. But at least the world knows now to never run on hospital floors covered in fresh blood.